"Bear News- Bear Facts for all Types of Bears"
excerpt "... A large black bear who wandered up into a tree at the University of Colorado - Boulder, is again safe after wildlife department officials managed to get him out of a sticky situation. The 200-pound male was seen ambling around a residence hall area before he attempted to scale a tree. The wildlife officers tranquilised the bear while he was up in the branches and, after a short wait, the bear safely landed on his back. 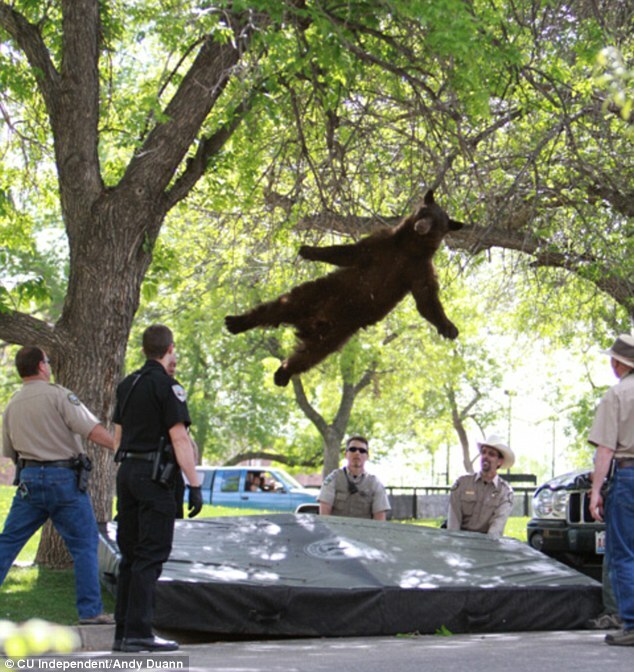 ..."
The Bear was tranquilised by the wildlife officials and landed on a soft mat provided by them on the ground underneath. Unlike winnie the pooh in his search for honey, the wild black bear did not have a balloon to help him fly! We like all types of bears and hope you enjoy our bear dictionary website where lots of bear facts can be found ..